Beacons are essentially mini transmitters that can automatically talk to mobile devices. The ones that Google is using look like small hockey pucks. Some stores are already using Beacon technology to provide in-store e-catalogues and product details. Google is taking the Beacon outdoors and providing another level of interactivity. Now, you don’t need to search for local information: the Beacon will beam that information to you. The key with this project is both local relevance and two-way communication. If you’re standing outside a concert venue and you spot a poster for an event you’d like to attend, you can instantly access information that is proactively offered by the nearest Beacon. And then, using Google’s implementation, you can buy tickets there and then. This is an important point, because Google is the first company to deploy two-way connectivity using Beacons. It has done this using Eddystone Ephemeral IDs, or Eddystone-EIDs, which offer secure communication in both directions over Bluetooth. Now, the Sensoro Beacons that Google uses provide more than just a flashlight. They can take payments, process reservations and send a URL to any device, so you can instantly access relevant, hyper-local information. For venues, retailers, sports halls, transport providers and museums, the possibilities of Beacon technology are endless. Visitors can buy passes, souvenirs, tickets and more, with the beacon handling all of the processing and payment. This means that, as a consumer, you can use your device in areas where mobile signal is patchy, with or without WiFi connectivity. Beacons use Bluetooth technology designed to cover short distances. Crucially, all of this can happen without security concerns, because Eddystone-EID technology works by changing its identifier continuously. That means nobody can spoof a device to carry out a fake transaction, and nobody can track devices without permission. Google’s Proximity Beacon API opens up the Internet of Things to a whole new audience, and one of its first deployments is via the Burnley to Manchester route. 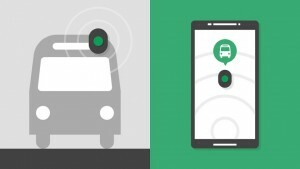 Google’s Beacons are being installed in selected buses, and developers are trialling Smart City apps that provide tickets and travel updates on the go. They can also support corporate branding, digital marketing and public service efficiency. Manchester City Council is currently looking at other Internet of Things initiatives, in conjunction with some of the world’s biggest tech brands like Cisco and BT. With £10 million in funding, the CityVerve project looks like one of the most exciting things to come to the North in many years. For more information about digital marketing, speak to us at Ultimate Creative Communications. We’re a corporate branding agency that has its finger on the pulse of the most exciting and innovative technologies.